This Handbook stands as the premier scholarly resource for Language and Social Interaction (LSI) subject matter and research, giving visibility and definition to this area of study and establishing a benchmark for the current state of scholarship. The Handbook identifies the five main subdisciplinary areas that make up LSI--language pragmatics, conversation analysis, language and social psychology, discourse analysis, and the ethnography of communication. One section of the volume is devoted to each area, providing a forum for a variety of authoritative voices to provide their respective views on the central concerns, research programs, and main findings of each area, and to articulate the present or emergent issues and directions. A sixth section addresses LSI in the context of broadcast media and the Internet. This volume's distinguished authors and original content contribute significantly to the advancement of LSI scholarship, circumscribing and clarifying the interrelationships among the questions, findings, and methods across LSI's subdisciplinary areas. Readers will come away richer in their understanding of the variety and depth of ways the intricacies of language and social interaction are revealed. 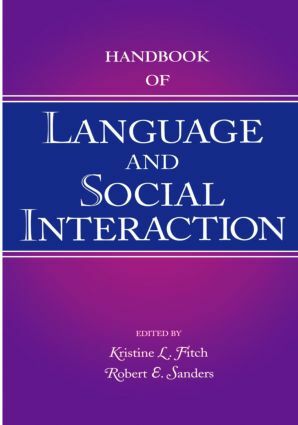 As an essential scholarly resource, this Handbook is required reading for scholars, researchers, and graduate students in language and social interaction, and it is destined to have a broad influence on future LSI study and research. "The handbook provides a good examination of current issues in LSI….The sections are arranged in an order that reflects, from least to most, the relative importance each subfield attaches to factors beyond the content of talk itself. Recommended." Contents: Preface. R.E. Sanders, Introduction: LSI as Subject Matter and as Multidisciplinary Confederation. Part I: Language Pragmatics. Preface to Part I: Language Pragmatics. F. Cooren, The Contribution of Speech Act Theory to the Analysis of Conversation: How Pre-Sequences Work. R.B. Arundale, Pragmatics, Conversational Implicature, and Conversation. Part II: Conversation Analysis. Preface to Part II: Conversation Analysis. P. Drew, Conversation Analysis. J. Heritage, Conversation Analysis and Institutional Talk. A. Pomerantz, J. Mandelbaum, Conversation Analytic Approaches to the Relevance and Uses of Relationship Categories in Interaction. Part III: Language and Social Psychology. Preface to Part III: Language and Social Psychology. J.B. Bavelas, The Two Solitudes: Reconciling Social Psychology and Language and Social Interaction. J.J. Bradac, H. Giles, Language and Social Psychology: Conceptual Niceties, Complexities, Curiosities, Monstrosities, and How It All Works. C. Gallois, S. McKay, J. Pittam, Intergroup Communication and Identity: Intercultural, Organizational, and Health Communication. Part IV: Discourse Analysis. Preface to Part IV: Discourse Analysis. D. Edwards, Discursive Psychology. S. Blum-Kulka, Rethinking Genre: Discursive Events as a Social Interactional Phenomenon. K. Tracy, Reconstructing Communicative Practices: Action-Implicative Discourse Analysis. Part V: Ethnography of Communication. Preface to Part V: Ethnography of Communication. W. Leeds-Hurwitz, Ethnography. G. Philipsen, L. Coutu, The Ethnography of Speaking. J. Streeck, S. Mehus, Microethnography: The Study of Practices. Part VI: Extensions of Technology. Preface to Part VI: Extensions of Technology. M. Aakhus, S. Jackson, Technology, Interaction, and Design. I. Hutchby, Conversation Analysis and the Study of Broadcast Talk. K.L. Fitch, Conclusion: Behind the Scenes of Language and Scholarly Interaction.